Professor Leah Boustan published a book entitled “Competition in the Promised Land: Black Migrants in Northern Cities and Labor Markets”. This builds on her 10 years of research into the great migration carried out at UCLA. A Quick Overview: From 1940 to 1970, nearly four million black migrants left the American rural South to settle in the industrial cities of the North and West. 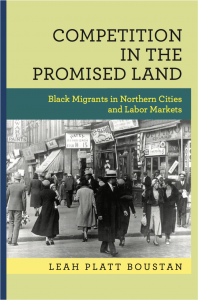 Competition in the Promised Land provides a comprehensive account of the long-lasting effects of the influx of black workers on labor markets and urban space in receiving areas. Traditionally, the Great Black Migration has been lauded as a path to general black economic progress. Leah Boustan challenges this view, arguing instead that the migration produced winners and losers within the black community. Boustan shows that migrants themselves gained tremendously, more than doubling their earnings by moving North. But these new arrivals competed with existing black workers, limiting black-white wage convergence in Northern labor markets and slowing black economic growth. Furthermore, many white households responded to the black migration by relocating to the suburbs. White flight was motivated not only by neighborhood racial change but also by the desire on the part of white residents to avoid participating in the local public services and fiscal obligations of increasingly diverse cities.